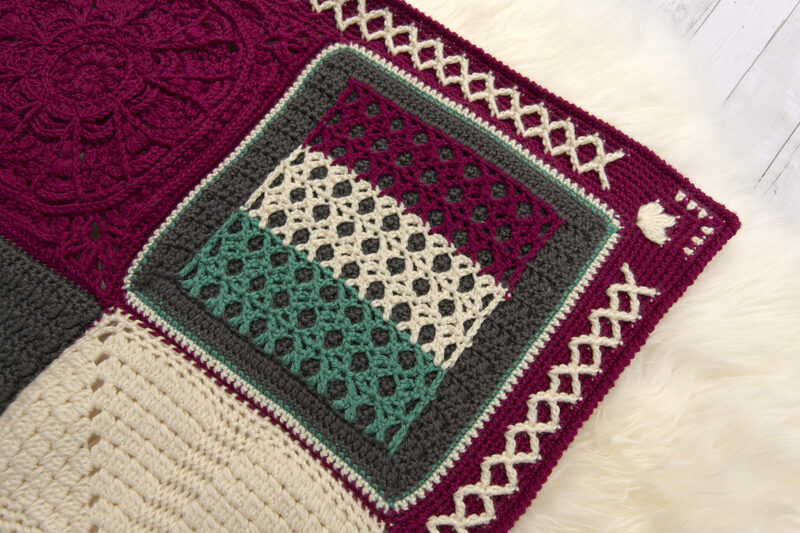 Share the love of many kisses by combining an X-stitch and double crochet to create a simple, elegant layered square. 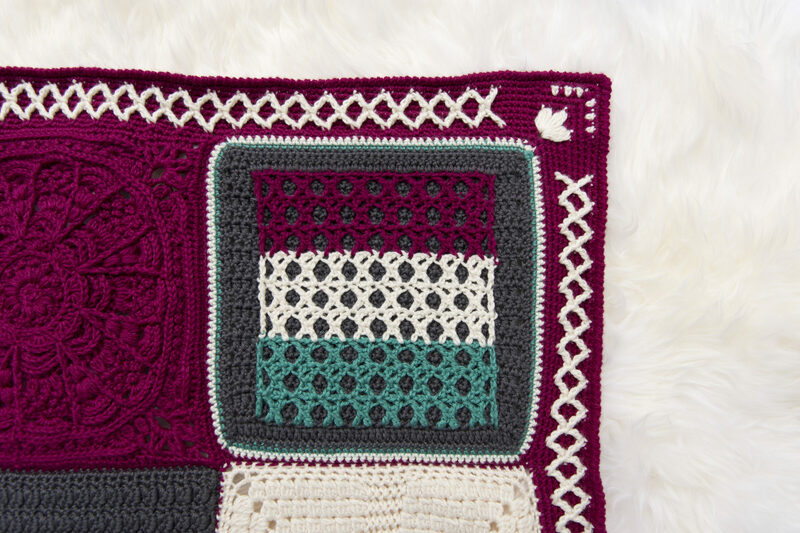 The Kisses Square is the second square that I designed as part of the Creative Crossings blanket. This was a collaborative project between 15 designers, as a token of appreciation for Lorene Eppolite is Cre8tion Crochet. We were lucky enough to be a part of her beta group in Cre8tion Business Academy. You can find the first square, Tunisian Checkerboard Square, here. The Kisses Square is a created in two “pieces” that can be made separately or simultaneously. 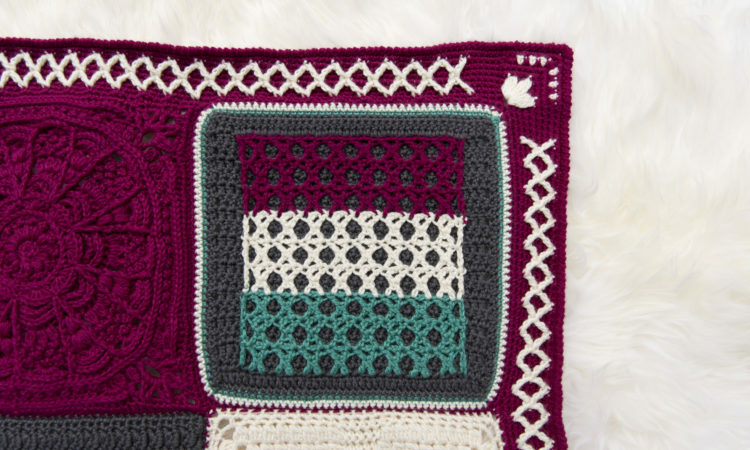 This square would be great in two or more colors to coordinate for any blanket project, and it’s great practice of the X Stitch. Does the X Stitch look familiar? It should since I’ve used it in a recent design, except this time there is no treble crochet between each X Stitch. This square is made in two pieces, the background color first, and then the X Stitch rows are worked on top. It may be helpful to fold the square along the row of front loops that you’re working into so you do not catch other stitches. Both pieces can be made at the same time by completing two rows of the background color followed by one row of X Stitch. Each row of X Stitch is the same height as two rows of dc. The first row of X-stitch will be attached by pulling the remaining loop through the first available front loop of Row 4 of the background, turn your work and then continue in pattern. Each following row of X Stitch attaches the pieces together by working through the available loop of the background and either the front or back loop (whichever is facing you) of the X stitch row. The final row of the background color is worked after completing the X Stitch rows. First-dc is used to minimize the gap along the edges, but can be substituted with a ch 3. First-dc is alway placed in the first stitch after turning. Row 1: Dc in the 4th ch from hook, dc in each ch across, turn. Row 2: First-dc in first st, dc in next 2 sts, FLdc in each stitch until last 3 sts, dc in last 3 sts, turn. Row 3: First-dc in first st, dc in each st across, turn. Using Color B, make a slip knot leaving a long tail, and pull through from the back and under the first front loop of Row 2 in the 4th st.
Row 1: Using Color A, rotate square to work down side, ch 1, place 2 sc in each dc to corner, 3 sc in first st of bottom side to create corner, sc in each st to next corner, 3 sc in last st, place 2 sc in each dc along side to corner, sc in first st, change to Color B in last st, sl st to join, turn. Row 2: ch 1, 2sc in first st, *sc in each st to corner, 3 sc in center st of corner. Repeat from * around the square, place last sc in the same space as first st (to make corner), change to Color C in last st, sl st to join, turn. Row 3: ch 1, 2sc in first st, *sc in each st to corner, ch 1. Repeat from * twice, sc to next corner, change to Color D, ch 1, sl st to first sc to join, turn. Row 4: ch 1, *(sc, ch 1, sc) in ch-1 space, sc in each st to next ch-1 space. Repeat from * around, sl st to join, fasten off. Weave in ends. © 2018 Courtney Whitehead. This pattern is not to be duplicated or resold, and not to be reproduced commercially. You may sell finished products on Etsy, at farmers markets, and craft fairs, but please credit Courtney Whitehead as the pattern’s author. Thank you.